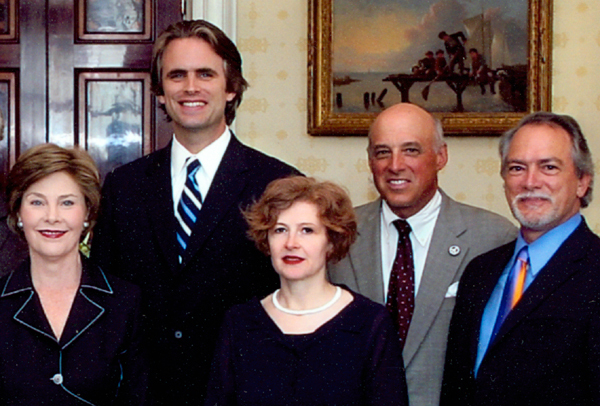 In 2007, C&G Partners went to the White House for lunch. The sitting First Lady is always designated the chair of the National Design Awards given by the Smithsonian's Cooper-Hewitt National Design Museum, and the firm was a finalist that year in the Communication Design category. Here is a never-before-released photograph from last year's event. (L to R: Laura Bush, Jonathan Alger , Emanuela Frigerio , Keith Helmetag , Steff Geissbuhler .) We were honored to be there -- and of course we'd be thrilled to have lunch with the new First-Lady-Elect someday.